How is the Moose the Largest Species of Deer in the World? The moose which is known as elk in Europe, and by its scientific name Alces alces, is the largest living species in the deer family. Moose can be found in all of Canada, most of Alaska, much of New England and upstate New York, and the upper Rocky Mountains. An adult moose stands about 6 to 7 feet high at the shoulder, and males can weigh up to 850–1580 pounds. Behind the bison, the Moose is the second largest land animal in both North America and Europe. That’s pretty big. 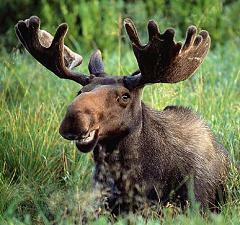 The male moose has antlers that grow on each side of the head at right angles which makes it look even bigger. Moose are so gigantic that a fully grown moose has few enemies, but a pack of wolves can still pose a threat, especially to smaller females with babies. What Is a Deer Tick, Where Do Deer Ticks Come From, and How Long Do Deer Ticks Live For Indoors? How Did the Moose Get its Name and What Does Moose Mean in Native American Language? Where Is the Largest Freshwater Lake In the World and How Many Species of Fish Are There In Lake Superior?